The Wellness Program at Arthritis & Rehabilitation Therapy Services (ARTS) is an extension of the program we offer to patients who have been prescribed a course of physical therapy as part of a medical treatment plan. It is also designed as a plan for individuals who are interested in participating in a safe and effective regimen geared toward promoting overall wellness. Massage Therapy – soft tissue services performed by a licensed massage therapist. Massage therapy focuses on relieving muscle pain in specific areas using manual techniques such as soft tissue mobilization, myofascial release, acupressure and trigger point release. Personal Training – offers one-on-one guidance for individuals interested in a personalized program of exercise to address their specific areas of concern. Yoga – to maintain or gain increased muscle tone, balance, strength and improved frame of mind. This class is specifically designed to allow people with arthritis, back pain or other musculoskeletal ailments to enjoy and reap the benefits of yoga. Pilates – Pilates improves core strength through the balanced development of the deep and superficial muscles that stabilize, align and move the trunk. Additional benefits include improved posture, balance, flexibility, coordination, mobility, as well as increased lung capacity and muscle tone. 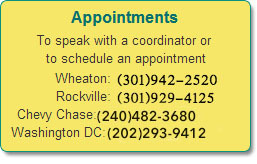 See here for the Pilates class schedules at Chevy Chase and K street locations. Osteoporosis Class – increases osteoporosis awareness while incorporating exercise to increase bone density, muscle strength, balance and posture. Based on the Sara Meeks Method for Osteoporosis, participants can reduce their fracture risk by incorporating low-impact, weight-bearing exercise and building core strength that increases balance and reduces the risk of falls. In the process, clients learn safe body mechanics and build confidence for carrying out daily activities. Back School – teaches participants how to protect their back and become more aware of habits and postures that can lead to problems or aggravate existing conditions. This course covers the anatomy of the spine, common injuries and disorders, as well as how proper body mechanics can protect the back while sitting, standing, lifting and doing household chores like vacuuming and gardening. The program addresses ergonomic issues associated with home or office work, along with the influence of sleeping positions. Open Gym – offers clients a customized exercise program based on a thorough review of their medical history and a physical assessment by a trained clinician. Individuals perform their exercise routine in the physical therapy space during business hours and have the opportunity to ask questions, have their exercise technique observed and corrected, and meet with their clinician once a month for a re-assessment and modification of their exercise program as needed. There are no contracts and clients can cancel at any time. Prior to participating, clients are asked to complete a health screening questionnaire that enables our staff to better understand individual needs and goals. For more information or to get started in the ARTS Wellness Program, please call the office nearest you. The Wellness Program is available at all four convenient ARTS locations.